Lewis Hamilton has pledged to bounce back after an off-form weekend for Mercedes in Singapore ended with his first retirement of the season. Hamilton's championship lead was cut to 41 points by team-mate Nico Rosberg, who finished fourth, and 49 by Ferrari's race-winner Sebastian Vettel. Hamilton said: "It's still a long way to go. I know I lost some points today. "But I was fast and on form and I will make sure I bring that to Suzuka next weekend to fight back." The Japanese Grand Prix is the first of six remaining races, with a maximum of 150 points still available. Asked whether he thought he could mount an unlikely title challenge, Vettel said: "If we have more weekends like this yes. We have to look at ourselves, can't control them (Mercedes). "We will give it everything, maximum attack and try to make the impossible possible." Vettel added: "I'm surprised they weren't on top of their game, I don't think anyone can give you an answer. Even them. "But they have to be the favourites going into Suzuka. If that is the turn of the page I wouldn't mind, but we can't expect that because they have a very competitive package." Hamilton had won seven of the 12 races before Singapore and been on pole 11 times. 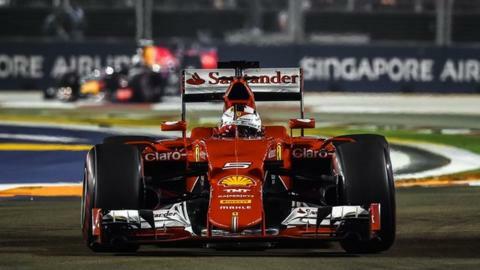 But he qualified fifth in Singapore, more than a second off Vettel's pole position, and was running fourth when he started to lose pace because of an engine problem which forced him to retire a few laps later. Hamilton said that he felt he was in with a chance of winning the race, because he was keeping pace with the three leaders in front of him despite being on harder tyres. But he did not know that Vettel was at the time driving deliberately slowly controlling the pace to look after his tyres. Rosberg admitted Mercedes were still mystified as to the reason for their lack of pace in Singapore. "The worst bit is we don't understand it," Rosberg said. "That's the worrying bit. "We just hope at the next track it will come towards us again, and the chances are extremely good because at all other tracks we've been so fast." Mercedes F1 boss Toto Wolff said: "You cannot write it off and say it was a one-off. On the other hand you cannot say we are terrified now; then you go into panic mode and that would be inappropriate and wrong."